Clearly, if we can find a method for numerically solving this problem, then we should have little difficulty generalizing it to deal with a system of simultaneous first-order o.d.e.s. 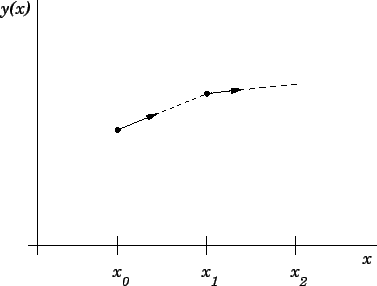 Here, the quantity is referred to as the step-length. Let be our approximation to at the grid-point . A numerical integration scheme is essentially a method which somehow employs the information contained in the original o.d.e., Eq. (5), to construct a series of rules interrelating the various . The above formula is the essence of Euler's method. It enables us to calculate all of the , given the initial value, , at the first grid-point, . Euler's method is illustrated in Fig. 4. Figure 4: Illustration of Euler's method.